Flip a coin. If heads, zap all enemies and opponents. Try to avoid using on water-type opponents when your health is below 80, as they will do surprisingly high damage on you. Listed the following: Snow Pea, Snow Banana, Iceberg Lettuce ect. Attacking fire-type plants will result the opposite. 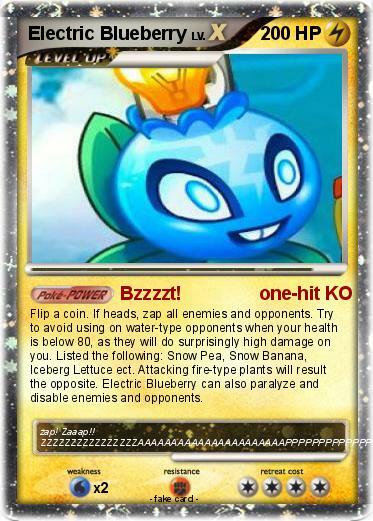 Electric Blueberry can also paralyze and disable enemies and opponents. Comments : zap! Zaaap!! ZZZZZZZZZZZZZZZZAAAAAAAAAAAAAAAAAAAAAAPPPPPPPPPPPPPPPPPPP!!!!!!!!!!!!!!!!! !